If you come into contact with light oil in your line of work, for instance when handling machinery, it can be difficult to always maintain grip. Slippery hands can limit your dexterity and impact your work performance. The Black Mamba Foam Nitrile Coated Material Handling Gloves PR-NC channel oil away from their surface to provide you with better grip, so you can get on with your work slip-free. The protective gloves are also ideal for those undertaking lighter industrial work, such as warehousing, who do not require heavy duty protection but simply want their hands to feel a little more comfortable. If you work in an industry which involves handling of car parts, such as car mechanics, you will likely come into contact with oil. When repairing and maintaining motorcycles and cars, dirty, oily hands are commonplace. Whilst this is not necessarily harmful, it can be a nuisance, causing your grip to slip for example when using tools. 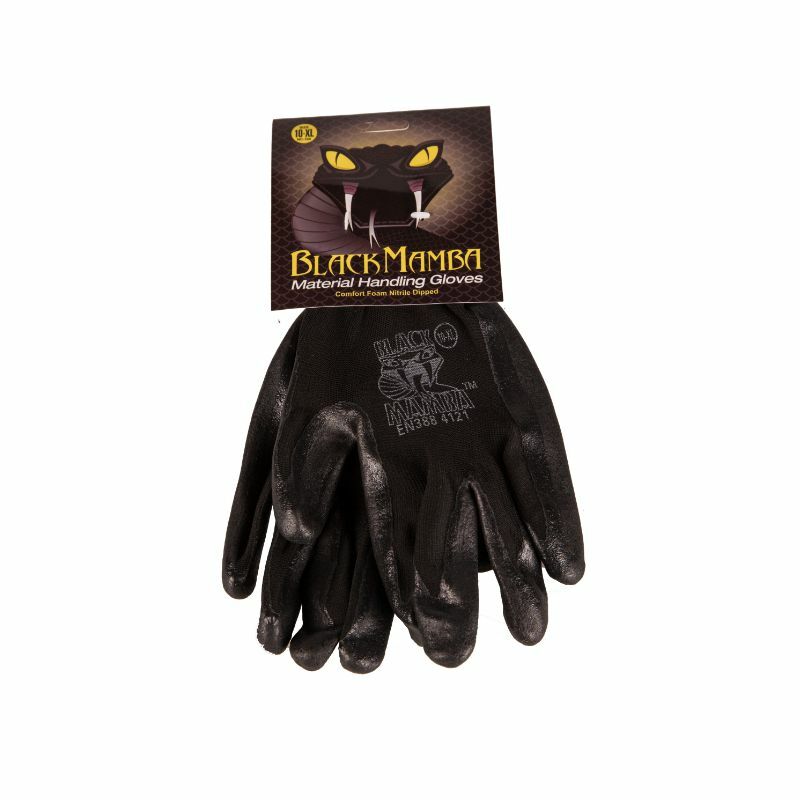 The foam nitrile coating on these Black Mamba Material Handling Gloves channels oil away from the glove's surface, helping keep the palms cleaner and drier. Therefore, the Black Mamba Foam Nitrile Gloves are ideal for application where secure handling is important, such as car mechanics and other jobs which involve using tools. If you work in a warehouse, your tasks may include the handling of products, cleaning, picking and packing. Whilst it is unlikely you will come into contact with harmful substances or very sharp objects the way you might when working in other professions, for instance mechanical engineering or window installation, your hands may still require some protection. You may, for instance, be handling objects such as scissors, Stanley knives, paper, card and plastic, which can still cut you. Furthermore, as warehouse work requires regular use of your hands, they may become scratched, worn, chafed or sore. 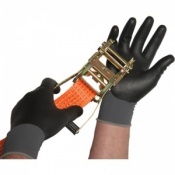 The Black Mamba Foam Nitrile Dipped Gloves are ideal for this line of work, offering less protection than more heavy duty gloves but simply enabling you to feel more comfortable as you work. 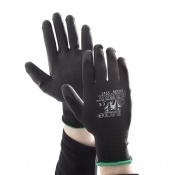 The Black Mamba Foam Nitrile Dipped Material Handling Gloves PR-PC are available in sizes M - XL. Please select from the drop down menu above.